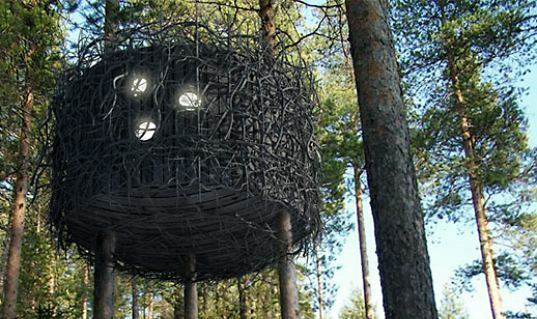 Stunning Swedish Treehotel Opens This Weekend! Do you have your sights set high for your summer vacation? 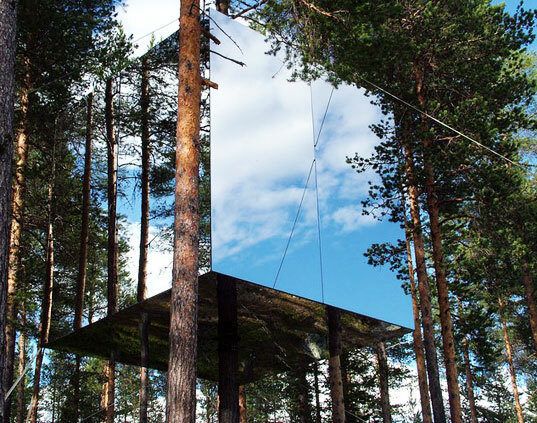 This gorgeous mirror-walled Swedish Treehotel, which opens this weekend, may just be the ticket. 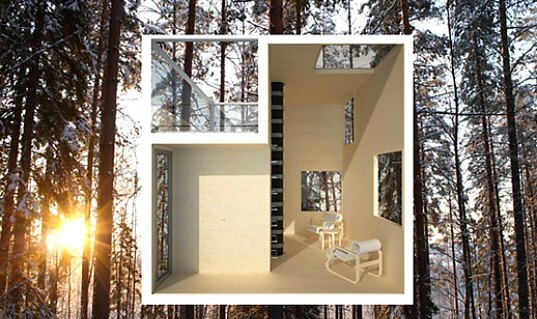 Set in the pristine forests of northern Sweden, just miles away from the Arctic Circle, the Treehotel combines stunning design with prefabricated treehouse construction plus eco-friendly building strategies that may have you drooling over a vacation in sunny -- yes sunny -- Sweden this summer. A lofty project in terms of both architecture and altitude, the Treehotel opens this Saturday, July 17th. So far, the hotel consists of four rooms, each located in a separate building suspended in the canopy of the lush and pristine Boreal forest. The four units that will be ready this weekend are the Cabin, the Blue Cone, the Nest and the Mirrorcube, each designed by a different architect to be completely unique. The owners of the hotel have plans for a total of 24 rooms designed by 24 architects within five years time. Two more rooms – the UFO and the Room With a View, will be completed this October before darkness descends for the winter season. The Mirrorcube is a prefabricated cube accessed via a ladder that runs straight up from the ground into the heart of the unit. As one might suspect from the name, the Mirrorcube is completely encased in mirrored walls that reflect the surrounding forest, allowing the structure to blend into the environment. The Blue Cone, which is actually painted red, utilizes traditional wood construction techniques with a facade of split birch and rests on three supports in the trees. The Bird’s Nest, which is aptly named, is a circular room built high on stilts that is accessed via a retractable staircase. The Cabin is another prefabricated structure built on a steep slope accessed via a footbridge that has beautiful views of the valley of the Lule River below. Along with their commitment to the Boreal Forest, the Treehotel is working to maintain the hotel with environmentally-friendly practices and keep the construction as green as possible. Each room features an eco-friendly incineration toilet and a water-efficient hand basin. The basin is called a a “Rukkomoinika” and is filled up with 3 liters of water each day, stopped with a plug, and used for washing hands and brushing teeth. The hotel will be open year-round with both winter and summer activities available for guests centered around exploring the surrounding environs. The founders of the hotel sought to keep the area as pristine as possible and therefore they are not offering activities which could degrade the environment, like snowmobile tours. Charmingly, the motto of Treehotel is “feel free in a tree”. 5 star treehouse - different class! Birds will be killed hitting into these monstrosities. A better device for killing the birds of the forest has yet to be invented - good work visionaries! Does the cost of room and board include the morning feathered corpse walk to admire how this piece of industrial garbage has \"blended into the environment\"? How many birds does this thing kill per hour? It may be difficult to clean the mirrors but reflections counter the maintenance problems. This design is in the positive when weighing it\'s pros and cons. The \"cons\" that worry me is birds flying into it and breaking their necks. Must be tough keeping all of those mirror walls see through clean! Opening this Saturday, July 17th, the Treehotel will have four rooms available for guests, including the Mirrorcube, the Cabin, the Bird's Nest and the Blue Cone. Each room was designed by a different architect and includes some prefabricated construction techniques as well as eco-friendly strategies. The Blue Cone (which will eventually be painted red) is currently under construction. The Cabin is a prefabricated unit which was trucked into the site and will be set high in the trees. Installed on a steep slope in the trees, the Cabin will be accessed via a footbridge and has beautiful views of the river valley below the site. A view into the canopy of the pristine Boreal forest at the site of the Treehotel. 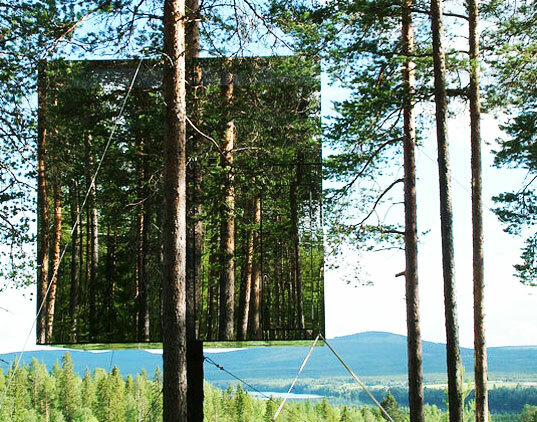 The Mirrorcube was designed by Tham & Videgård Arkitekter. It consists of a lightweight aluminum structure hung from a single tree. Access is gained via a ladder that comes up through the floor into the cube. Coated in a reflective surface, the Mirrorcube will reflect its surroundings and blend into the environment. The Cabin was designed by Cyrén & Cyrén and is a prefabricated unit located on a steep site and accessed via a footbridge. The actual tree house is suspended from the deck. This will hide the volume of the building to a certain degree. The deck is slightly separated from the building in order to make it appear smaller and to allow the building its own expression. The footbridge offers opportunities for expansion with other treehouses and viewing decks built from the same foundation. The Blue Cone, which will actually be red, was designed by SandellSandberg and is made from lightweight wood construction with a split birch facade. This tree room is founded on three points of support. Access to the tree room is by a bridge from the mountain behind. The Bird's Nest was designed by Inredningsgruppen and resembles -- what else -- a bird's nest. Inside the bird's nest is enough space for a couple and two children. This room, for example, is offered for 3,800 Swedish Crowns ($512 USD) per night and includes breakfast. The Bird's nest is reminiscent of a water tower built on stilts that has been camouflaged with sticks and woods to blend into the environment. Accessed is provided via a retractable staircase. The Room With A View will be completed in October and is designed by Marge Architects. It offers three unique perspectives on the woods and the Harads landscape. Exterior walls are clad with dark construction plywood that reflects sunlight; interiors are paneled with pinewood to enhance the warm atmosphere of the woods. Isolated glass partitions divide nature from the interior of the hotel room. The cabin rests on a steel structure with a steel staircase, a contrasting material to the pine bark surroundings. Finally, the UFO, which will be completed in October, is designed by Inredningsgruppen and is meant to be the complete opposite of the nature inspired Bird's Nest, designed by the same firm.